On March 25th, 2019 an alert motorist contacted police after observing a white pickup truck enter the ditch and return to the roadway on Grey Road 12 east of Highway 6. Officers responded and located the suspect truck travelling south bound on Highway 6. A traffic stop was conducted and the officer formed the grounds to believe the driver was impaired by drug. The driver was arrested and transported to the police station where a Drug Recognition Expert evaluation was conducted. Subsequent to the evaluation, the 36 year old male of West Grey was deemed Impaired by Drug. The driver’s vehicle was impounded for seven days and his driver’s license was suspended for 90 days. After processing, the driver was released by way of a promise to appear and was given a court date to attend the Walkerton Courthouse where he will answer to the charge. On March 22nd 2019 police received a report of damage that had been done to a vehicle parked on Saddler St E in Durham. Sometime between 2:30 p.m. and 6:30 p.m. on the 21st of March, unknown culprit(s) tried to pry the driver’s door open and used what is believed to have been a hammer to cause $4000 damage to the driver side door. West Grey Police are reaching out to the public and asking anyone who may have information about this incident to contact the West Grey Police Service at 519-371-6911 or Crime Stoppers at 1-800-222-8477. On March 23rd, 2019 police responded to a reported assault. The female victim was transported by EMS to a nearby hospital for observation. A warrant was obtained for the arrest of the 34 year old male suspect from West Grey on two charges of Assault, one of Mischief and one of Breach of Recognizance. If you know someone who is being abused, contact police immediately, help is always just a phone call away. On March 23, 2019 a resident located a mail box in a creek. It was determined the mailbox had was the same one that had been stolen the previous week from an address on Concession 2 WGR. The mailbox was returned to its rightful owner. We thank our community members for their continued support and for coming forward. On March 23rd, 2019 police responded after other motorists observed a vehicle leave the roadway on Lambton Street East, drive onto the grassy area west of Rock St, come back on the roadway at Rock St and then end up back off the roadway east of Rock St. The male driver, a 26 year old from West Grey, was ultimately charged with Careless Driving. Police would like to thank the motorists who stayed with the vehicle and the driver when he refused to exit the vehicle or put the vehicle in park. On March 27th, 2019 West Grey Police were alerted to be on the lookout for a vehicle that was driving into the West Grey area being driven by a male was observed at an Owen Sound business to have smelt of alcohol. Police were able to locate the vehicle and intercepted a 65 year old driver. The driver provided a breath sample at roadside and registered a reading in the WARN range. Subsequently the West Grey man was given an automatic three day driver’s license suspension. Thank you to those who assisted in keeping our roadways safe. On March 27th, 2019 police received reports about garbage dumping on two roadways in West Grey. This is an offence that is punishable under the Provincial Offences Act and any of the dumpers who are identified will be charged accordingly. The public is encouraged to call police if you see someone dumping garbage on our roadways. On March 28th, 2019 police attended a residence in Durham after the homeowner reported that unknown culprit(s) had spray painted graffiti on the side of her house. The graffiti mimics what has been spray painted in another area of town. Anyone who has information that can lead to an arrest in this matter is asked to call West Grey Police at 519-731-6911 or Crime Stoppers at 1-800-222-8477. The colors of spray paint used were purple and red. 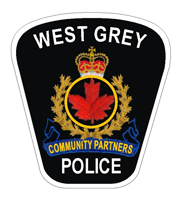 On March 28th, 2019 a West Grey resident reported being scammed out of $1000.00. Unknown culprits used a variation of the grandparent scam to convince the reporting party to send money using Western Union. Police urge the public to be vigilant when it comes to requests for money made by people you don’t know and for reasons you can’t verify. With tax season here, CRA scam attempts will be on the rise. Remember that the CRA will never call you and threaten your arrest if you do not pay. Any scam attempts should be reported the Canadian Anti-Fraud Center at 1-800-959-8281 as well as your local Police Service.